These three photo all-in-ones vary in their success: the HP and the Epson show up with high-quality scans, copies, and prints, while the Lexmark falls down on the job. Surprisingly, each of these all-in-ones is just a couple of inches larger than a regular photo ink-jet printer, with footprints of about 18 inches square. Their heights range from 9 to 12 inches (with scanner lids down and letter-size paper in input and output trays). If you want to make prints straight from your digital camera's media card, the HP and the Epson can accommodate you. When you insert a media card into the HP printer, the 2.5-inch LCD displays the images on the card. From there, you can choose which images you want to print. The Epson has a small, text-only menu screen that doesn't display images. Instead, you print an index sheet to see numbered thumbnails of your photos. You then fill in the index sheet's bubbles with a pen, place the index sheet on the scanner glass, and print your order. Or you can select the photo's number via the menu screen. Unlike the Epson and the HP, the Lexmark requires that you use your Mac to open and print the images, using an app such as Adobe Photoshop or Apple's iPhoto. In fact, you must have the Mac running any time you want to use the Lexmark all-in-one printer. Each of the all-in-one printers we tested prints with as many as six color inks, which make for better-quality photos. The HP comes with one black cartridge and a tricolor cartridge; to print photos, you swap out the black cartridge for a $25 tricolor, photo-color cartridge. The Lexmark also uses this three-cartridge scheme, but the black cartridge is the $25 option. The Epson comes with six individual cartridges. As we've noted in previous printer reviews, the upside to this configuration is that when an ink color runs out, you have to replace only that cartridge. The scanners on these devices are all flatbeds located on top of the printers. The Epson has two special scanning features the other ones don't have. First, it lets you save your scanned images directly to an inserted memory card for storage or sharing. Second, it has a built-in transparency adapter, so you can scan film, some types of negatives, and slides. It produced good-quality scans -- it's perfectly suited to the photo hobbyist. The Lexmark has one strange design flaw: its scanner bed slants downward in the front. When we used the scanner, we had to tilt the unit backward, place the photo on the glass, close the lid, and set the unit back down. This was the only way to avoid partial scans. A scanner's optical resolution may be important if you want to print photos larger than the originals. Each printer had an acceptable resolution. Because these units have both a scanner and a printer, they can work as black-and-white or color copiers. Overall, we were surprised by how well this function worked in these devices. Of course it's important to find out how well these all-in-ones print and scan, but we went a couple of steps further. We wanted to find out whether they could print photos comparable to those from online photo labs, whether getting the best prints required editing images in Photoshop or another application before printing, how well the products would reproduce color images, and how long they would take to print the best photos. We shot several digital photos and ordered prints from Ofoto and Photo Access, two of our favorite online photo services. Then we opened the photos in Photoshop and printed them on each device. In the Print dialog box, we chose whatever color-correction profiles came with the printer: ColorSync for the Epson and the Lexmark, and ColorSmart III for the HP. When our panel of experts compared these two sets of prints, they preferred the HP and Epson prints to those from the online photo services. The panel praised the HP output for the bright, healthy glow of the people in the photos. The Epson printed a bit darker than the HP, but the color was more consistent throughout. The Lexmark print had overblown highlights and visible artifacts throughout the image. We also printed the test photos directly from a memory card to the Epson and HP printers. The HP prints were too red -- the subjects' skin appeared sunburned. The Epson print was actually slightly better than the photo we printed from the Mac. To judge general print and copy quality, we printed our standard test image from Photoshop to each printer and made a color copy of it using the all-in-ones' scanners. We compared the printers' output with our high-quality, professionally made proof. The Epson prints were truer to the proof both times, with very nice color fidelity and detail. The panel approved of the HP's prints and copies, but the copies lost some of the fine detail present in the original prints. The Lexmark's reds in the Photoshop print were oversaturated and gaudy. The copy was dark and had a green cast; orange bell peppers printed red; and red items were a dark bloodred. We also compared prints made using each all-in-ones' two highest-quality settings. Interestingly, our jury found that the Epson's second-highest setting produced better results than its highest, which was too dark. We found hardly any difference between the Lexmark's top two resolutions -- neither produced pleasing prints. If we didn't print using the HP's highest setting, faint vertical lines appeared on the prints. Printing the best-looking 4-by-6-inch photo took the Epson 2 minutes and 15 seconds. It took the HP 4 minutes and 25 seconds, and it took the Lexmark 6 minutes and 50 seconds. To test each all-in-one's scanner for speed and the ability to capture detail, we scanned a section of our test image at 1,200 dpi. They all did a fine job on detail. The Epson and the HP also did well with colors, but the Lexmark scan, like its prints, suffered from oversaturated reds. The HP finished our 1,200-dpi scan first, in about 26 seconds. The Epson came in at about 35 seconds, and the Lexmark took about a minute. You can't save every old, mistreated photo, but the Epson gives it a try. It comes with Photo Fix software, which you can enable in the software driver; it tries to restore a faded or discolored photo's original color. We tried it on a couple of photos from the 1960s, and it produced scans that put them back in the right color ballpark, but weren't exactly perfect. The results were comparable to those of Photoshop's Auto Levels command. If you're in need of a photo printer that can do much more than print, your choices from this batch of products are clear: The HP makes printing photos about as easy as it can get. But with more-accurate colors and an included transparency unit, the Epson takes the prize. 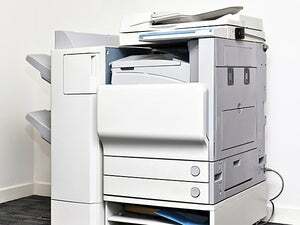 The Lexmark, regardless of its low price, is not worth considering.